I, for one, felt pretty good about this series after the first two games. The Blackhawks went down to Tampa Bay and took Game 1 thus giving them home ice advantage in the series. They lost the second game, a game which they could have won, but it wasn’t the end of the world. They met their goal by getting at least one victory in Tampa. With the series then headed back here to Chicago where the Hawks have been rather dominant this postseason, I thought it was very possible they could win both games at home to go up 3-1 in the series. Well after last night, that is no longer possible. 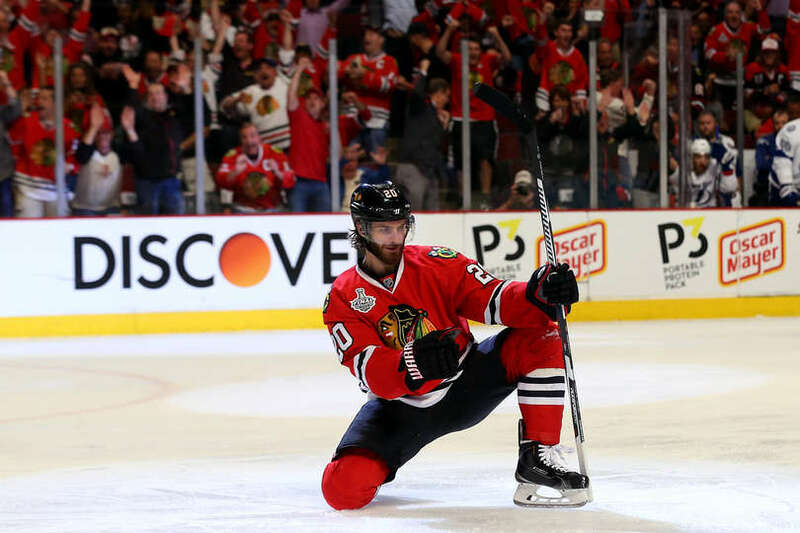 Game 3 was a game that the Blackhawks really should have never lost, but they did by a score of 3-2. After Ryan Callahan opened up the scoring early in the first period, the Hawks absolutely dominated the remainder of the period and ended it with 19 shots on goal compared to the Lightning’s 7. In terms of Corsi, the Hawks had a 33-11 advantage after the first period (33 shot attempts to 11). Those are some pretty staggering numbers, yet only Brad Richards was able to find the back of the net for the Hawks through the first 20 minutes and the game was tied at 1 apiece. It seemed logical to think that the Blackhawks would come out in the second and try to pick up right where they left off in the first, but that didn’t happen. Tampa Bay owned the second period and out-shot the Hawks 17-7. The Lightning did have an extended 5 on 3, which partially led to that shot disparity between the two teams, but they still dominated the whole period. The puck seemingly never left their offensive zone for more than a few seconds at a time, and the Hawks were completely unable to get any sort of momentum going. However, despite their shot advantage and the fact that they had a lengthy 5 on 3 powerplay, Tampa Bay did not score in the period, and it remained 1-1 heading into the third. Just over four minutes into the third period, Marian Hossa found Brandon Saad wide open in the slot and hit him with a perfect pass to set up a one-timer. Saad made no mistake on the shot and blew it by the glove side of Bishop to put the Hawks in front 2-1. For roughly the next 12 minutes, things went back and forth with Tampa Bay getting mostly better chances than the Hawks. Nothing would go in, though, until just over 3 minutes were left in regulation. Victor Hedman carried the puck up the ice and into the offensive zone, weaved through the Hawks’ defenders, then centered a pass from the goal line to Crawford’s right and found the stick of Cedric Paquette who simply redirected it into the empty net. Just like that, 3-2. There would be no “miracle on Madison” in the final minutes of regulation, and the Hawks now find themselves down 2-1 in the series with the Lightning regaining home ice advantage. After a first period in which the Hawks dominated once allowing Ryan Callahan to score, they only found themselves tied at 1 on the scoreboard. Both Marian Hossa and Teuvo Teravainen had point blank, empty net scoring chances in the period, but neither one hit the net. Granted, Marian Hossa was tripped while attempting the shot, but that’s not a good enough excuse in my mind. Had the Hawks buried either one or both of those chances, there’s a real possibility that we’re talking about a victory right now rather than a loss. Staying with the “dominating first period” theme, the fact that the Hawks came out as flat as they did in the second was mind blowing to me. They had Tampa Bay on the ropes after the opening 20, and then let them back in it in the second frame. What in the world is going on with Ben Bishop? He and Jon Cooper insist that he’s fine and that he’s capable of playing, but the eye test would say otherwise. Yes, Bishop did end up with a 36-save victory, but the Blackhawks never really tested him as much as they should have. Joel Quenneville said so following the game Monday night. It’s pretty evident that Bishop is having some serious trouble moving side to side, specifically right to left, yet the Blackhawks never were able to establish enough offensive zone time to test him with those movements. 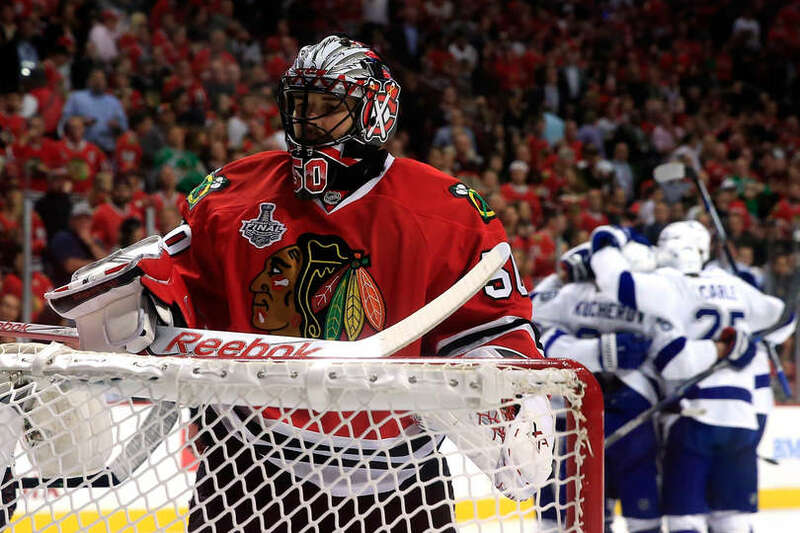 If Bishop plays again in Game 4, it would be wise of the Blackhawks to test him early and often. The star players of the Hawks need to start showing up on the score sheet. Last night, the first line of Saad, Toews, and Hossa was extremely good and even registered a goal (Saad). Having said that, guys like Toews, Kane, Hossa, and Sharp have got to start finding the back of the net or at least begin creating goals for other linemates. The Blackhawks will not win this series without those guys producing. I also believe that if those guys do begin scoring, the Hawks will not lose this series. If you recall, Toews and Kane did a whole lot of nothing in games 1-3 in each of their previous two Stanley Cup Final appearances. Then in games 4-6, they dominated. Hopefully history repeats itself. Monday night’s loss marked the TENTH time this postseason that the Blackhawks have allowed a goal less than two minutes after scoring one themselves. Instead of letting up after scoring, it’s about time they do the opposite and go for the kill. Corey Crawford, while not horrible, has not been his best the last two games. He’s got to find a way to keep the goals scored by Callahan and Palat out of the net. Byan Bickell played one of his worst games of the year in Game 3, and that’s saying something. I am all for Quenneville benching him and reinserting Kris Versteeg for Game 4. Versteeg brings speed and energy, both of which fit nicely in this series. Lastly, TVR. I thought van Riemsdyk had and “okay” game Monday night, as Quenneville would say. He made some real nice passes and plays to get out of his own end, but he also turned the puck over a couple times in the defensive zone. Instead of forcing the puck up the boards in an attempt to clear the zone, try looking towards the middle of the ice where there’s less traffic. While there is no question that Game 3 stung, this is only a 2-1 series right now. The Hawks can still even this thing up Wednesday night. There is no denying that they cannot afford to lose Game 4, so I would expect to see the Hawks’ best effort of the series so far. Jonathan Toews has said a couple of times recently that the Hawks seem to play their best hockey when they are backed up against a wall. Well, I’d consider their backs to be against the wall now. If the Hawks can pull out a win in Game 4, they’ll head back to Tampa Bay where the Lightning have been very disappointing this postseason. They are a weak 6-6 at home during the playoffs. This series is far from over, but a Hawks victory is imperative Wednesday night. This entry was posted in NHL and tagged Ben Bishop, Blackhawks, Chicago Blackhawks, Corey Crawford, hockey, Joel Quenneville, Jonathan Toews, Marian Hossa, Patrick Kane, sports, stanley cup, stanley cup final by Kurt Schwerman. Bookmark the permalink.